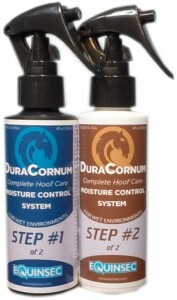 DuraCornum complete hoof protection now comes in an even easier application; a spray bottle. The same formula, perfect for all hooves in all environments, is now quicker and easier to apply than ever. Equinsec is a company dedicated to creating the very best quality products possible. Complete hoof care is our specialty, we strive to help you and your horse perform at the highest possible level.